I've been continuing to explore the so-called Mystical Alphabet over the last few weeks. Rather than writing things up here, I've been adding to my Visible Mantra website. Now see also my book Visible Mantra, which has a lot more information on the Arapacana including comparisons of the various Chinese translations of the Arapacana in the Large Perfection of Wisdom Sūtras. I'd like to draw attention to various bits of that site here, and to post a selection from my bibliography covering the alphabet. "The letter A is a door to all dharmas because they are originally unarisen". The background theory of this statement is covered on Visible Mantra on the page called Dharma Doors. I have also created a calligraphy project based on this phrase. 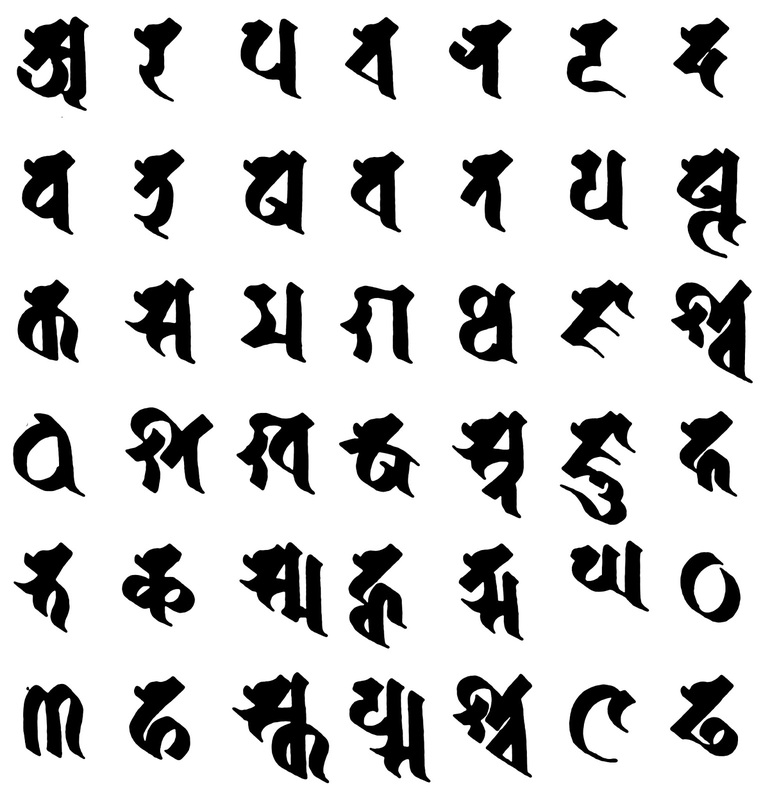 Additional aspects are discussed on pages devoted to a alphabet calligraphy project, and on the Mañjuśrī mantra page. There is much more that could be said about this phrase as it moves from it's source as an insight meditation subject in the Pañcaviṃśatisāhasrikā Prajñāpāramita Sūtra, to the Mahāvairocana Sūtra where it takes on a tantric character, and then into the final phase in the yogini tantras, such as the Hevajra Tantra, where it becomes a mantra in it's own right. Various pages in Visible Mantra covering seed syllables take the theory of mantra in a slightly different direction, initially established by Upanishadic sages. Blog posts on hrīḥ, dhīḥ are now supplemented by the Visible mantra page on hūṃ, which gives a very short account of Kūkai's text Ungi gi - The Meanings of the Seed Syllable Hūṃ. The oṃ page now features the greatest range of variations of writing styles - and there are more to come. Bibliography of sources directly related to the Arapacana Alphabet. Bays, G. (1983). The Lalitavistara Sūtra. 2 vol. The Voice of the Buddha: the beauty of compassion. Berkeley: Dharma Publishing. Brough, John. (1977). The arapacana syllabry in the old Laita-vistara. Bulletin of the School of Oriental and African Studies. 40 (1), p.85-95. Clear, Thomas. (trans.) 1989. Entry into the realm of reality : the text : a translation of the Gandavyuha, the final book of the Avatamsaka Sutra. Boston : Shambala. Conze, E. 1975. (trans.) The large sutra on perfect wisdom : with the divisions of the Abhisamayālankāra. Delhi : Motilal Banarsidass. Conze, E. 1978. 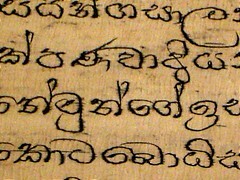 The prajñāpāramita literature. (2nd rev. ed.) Tokyo : The Reiyukai. Davidson, R. M. 1995. 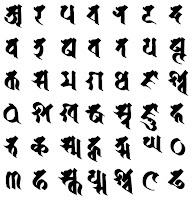 The Litany of names of Mañjuśrī in Lopez, Donald S. [ed.] Religions of India in Practice. University of Princeton Press. Farrow, G.W. and Menon, I. 1992. The concealed Essence of the Hevajra Tantra : with the commentary Yogaratnamālā. Delhi : Motilal Banarsidass, 2001 printing. Mukherjee, B. N. 1999. Arapacana : a mystic Buddhist script in Bhattacharya, N. N. (ed) Tantric Buddhism New Delhi : Manohar Publishers & Distributors. p.303-317. 1993. An additional note on arapacana. Journal of the American Oriental Society. Vol.113 (2), p.275-6. 1998. Indian Epigraphy: A Guide to the Study of Inscriptions in Sanskrit, Prakrit, and the other Indo-Aryan Languages. New York, Oxford University Press. 2004. An Arapacana Abecedary from Kara Tepe (Termez, Uzbekistan). Bulletin of the Asia Institute. Vol. 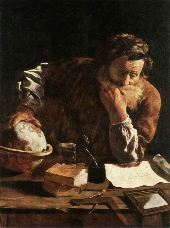 18, p. 43-51. 2006. Kharoṣṭhī syllables used as location markers in Gāndhāran stūpa architecture. Pierfrancesco Callieri, ed., Architetti, Capomastri, Artigiani: L’organizzazione dei cantieri e della produzione artistica nell’asia ellenistica. 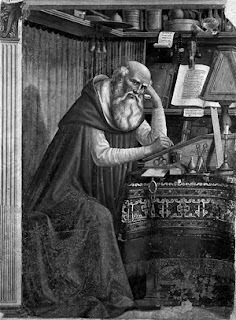 Studi offerti a Domenico Faccenna nel suo ottantesimo compleanno. (Serie Orientale Rome 100; Rome: Istituto Italiano per l’Africa e l’Oriente, 2006), pp. 181-224. 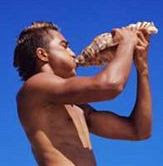 Scharfe, Harmut. 2002. Kharoṣṭhī and Brāhmī. Journal of the American Oriental Society. 122 (2), p.391-3. Strauch, Ingo. 2007. The Bajaur collection: A new collection of Kharoṣṭhī manuscripts. A preliminary catalogue and survey (in progress). Available online [pdf]. See especially p.37-40. Wayman, A. 1985. Chanting the names of Mañjuśrī : the Mañjuśrī -nāma-samgīti : Sanskrit and Tibetan texts. Delhi : Motilal Banarsidass, . "the only hitherto known Gāndhārī text arranged according to the sequence of the Arapacana syllabary. In addition, it is the only Gāndhārī text preserving an almost complete specimen of this alphabet which later on became widely popular in Mahāyāna and Vajrayāna circles." This is a very important find! It confirms much of what Prof. Richard Salomon has been proposing in his papers (see above), and may give us further insight into the use of alphabet based mnemonics. What the text says I still don't know... watch this space. 24 Nov. Sound files from my evening at the Cambridge Buddhist Centre, 1 Nov 2007.